Arab traders began arriving in Singapore shortly after the British established a trading port on the island. Despite its small size, the Arab community quickly grew in importance and prominence. One well-known Arab family was the Alkaffs, who originally came from Wadi Hadhramaut (a region in present-day Yemen). They had a lucrative business trading in spices, sugar, coffee, and textiles. The Alkaff family also invested in real estate. By the turn of the 20th century, they were one of Singapore's largest property owners. Their properties included Hotel de l’Europe, a luxury hotel located on the site of the Former Supreme Court which was comparable to Raffles Hotel; Arcade Building, an outstanding Moorish-style commercial building on the waterfront demolished in 1978; and Alkaff Mansion, built as a holiday home on Telok Blangah Hill. Besides being successful traders and landowners, the Alkaffs were also known to be generous philanthropists. They were involved in numerous charitable works, including the construction of the now defunct Alkaff Lake Gardens (a public park with a Japanese theme) and that of two mosques, namely one on Jalan Abdul Manan, which was later rebuilt on Bedok Reservoir Road and renamed Alkaff Kampong Melayu Mosque, and another between the former Bidadari Cemetery and Alkaff Lake Gardens – now known as Alkaff Upper Serangoon Mosque. 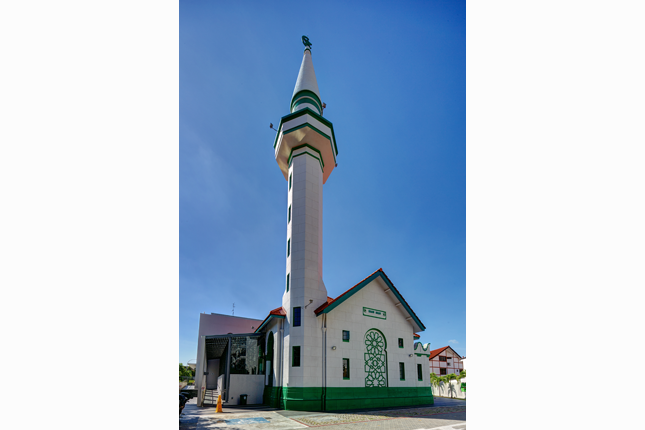 Westerhout & Oman was initially called upon to design Alkaff Upper Serangoon Mosque. The mosque's architectural plans were ready in 1927. However, the sudden death of W. Campbell Oman, one of the firm’s partners, in 1929 stalled the mosque's construction. His partner, Johannes B. Westerhout, was unable to complete the project, and the architectural drawings were subsequently abandoned. The Alkaffs then turned to Swan & Maclaren to prepare new plans for the proposed mosque. This same architectural firm was also responsible for the designs of the Cenotaph, Sultan Mosque, and the Former Tanjong Pagar Railway Station. 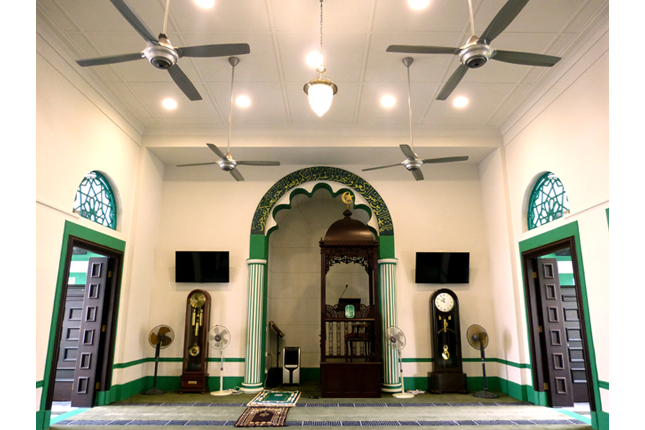 Syed Abdul Rahman bin Shaikh Alkaff, the head of the Alkaff family in Singapore, funded the mosque’s construction on his land. The mosque was opened for public worship on 24 June 1932. 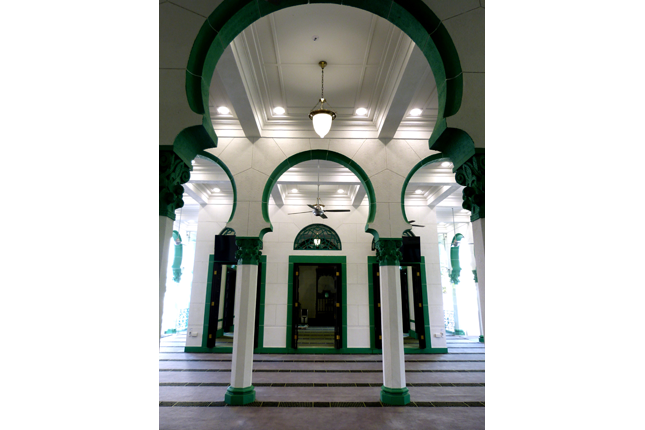 Alkaff Upper Serangoon Mosque has an eclectic design that combines various architectural styles. The minaret is one of its most outstanding elements. 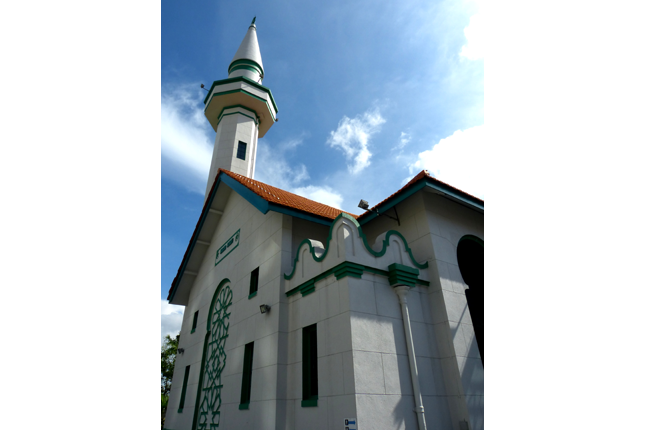 Unlike the minarets of many other mosques in Singapore, such as Sultan Mosque and Jamae Mosque, towers of which are topped by ogee-shaped domes, Alkaff Upper Serangoon Mosque’s minaret is pencil-like, a feature popular in Ottoman Islamic architecture. The main prayer hall is a hypostyle hall lined with rows of Moorish-style horseshoe arches supported by columns that resemble those of the Corinthian order. Neoclassical influence is seen in the coffered ceiling and semi-circular fanlights above the doors. The mihrab (a niche in the prayer hall that indicates the direction of Mecca, towards which all Muslims pray) has a multifoil arch and is flanked by twin fluted pilasters. Sermons are preached from an elaborately carved wooden minbar (pulpit) standing in the mihrab. 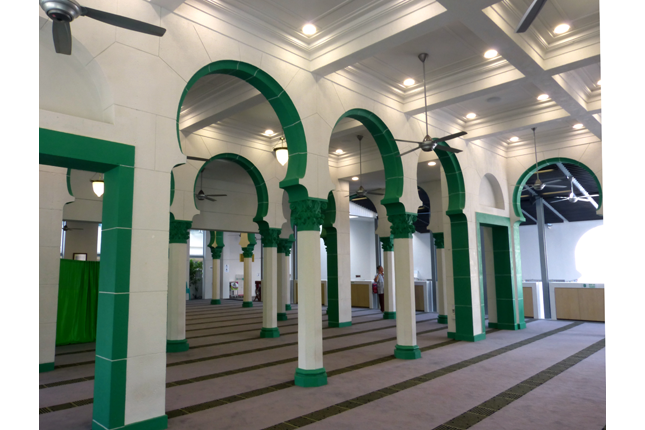 Alkaff Upper Serangoon Mosque completed its latest restoration and renovation in March 2014. In addition to expanding the prayer space, features such as ramps and a lift were added to make the mosque more elderly-friendly. A new annex building was also erected to house classrooms and offices. Muslims living and working in the vicinity continue to worship at the mosque today. It is currently managed by the Islamic Religious Council of Singapore (Majlis Ugama Islam Singapura, MUIS).